The publisher did a great job of creating a striking cover which pulls the reader in. What’s in all of those bottles? Are they cures…or poisons? Who does that cabinet belong to? Leave a Comment below and tell me what you think. I’d love to know your thoughts. Be sure to visit the Amazon page to pre-order your copy of the book. You will get the best price match guarantee from Amazon should the price drop later on. Plus, Amazon has been known to ship pre-ordered books to customers a couple days ahead of the release date. It’s true. Pre-orders are really important to authors because they tell the publisher readers are interested in the series. And interest in series means authors get the “Go ahead!” to write more books you love around the characters you adore…or love to hate. Feel free to forward this e-mail to other readers and friends whom you think might enjoy Florence’s adventures—nurses, Victorian-era buffs, historical mystery lovers, etc. We’re working hard behind the scenes to get the word out and having you join our efforts is icing on the cake. So, share the news and tell your friends about the characters in the books you’ve been reading. Cholera has broken out in London, but Florence Nightingale has bigger problems when people begin dying of a far more intentional cause―murder. 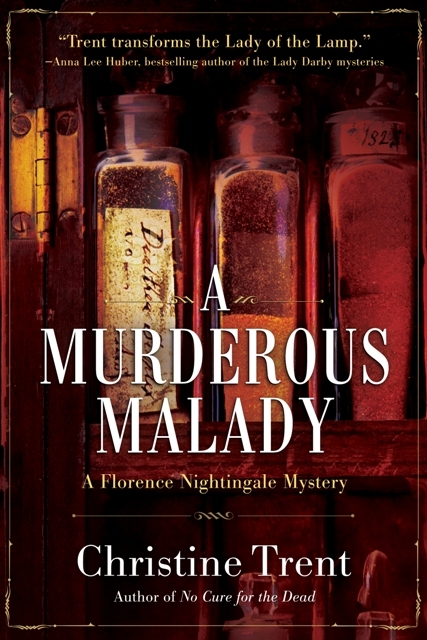 Now, Florence is in a race against time―not only to save the victims of a lethal disease, but to foil a murderer with a disturbingly sinister goal―in A Murderous Malady. But even as I considered making another visit to the priest, a story was forming in my mind. It was a tale full of anger and hatred, and was so malicious as to be unfathomable, given how many people could have actually died had the killer’s entire plan worked properly. If my theory was correct, Liz might not ever feel safe again. The killer’s face loomed large in my mind and I shuddered. But I was still missing one important piece of the puzzle. “Goose, I believe I know what happened,” I said quietly to her as we made our way back to St. Luke’s. “Right now, you can stay at my side. Strength in numbers, right?” I laughed weakly, but I was becoming deeply concerned that the killer might know by now that I was figuring things out. I took a deep breath. The sooner I finished my investigation, the sooner a murderer could be arrested. Be sure to click here to visit the Amazon page to order your copy of the book. And don’t forget to leave a Comment below and tell me what you think may be inside the bottles shown on the cover. I truly do want to read your guesses.